May is National Bike Month, National Pregnancy Awareness Month (wha? ), and in some circles it’s also National Shoe Month. But what we’re really into this month is National Barbecue Month! Oh yeah. 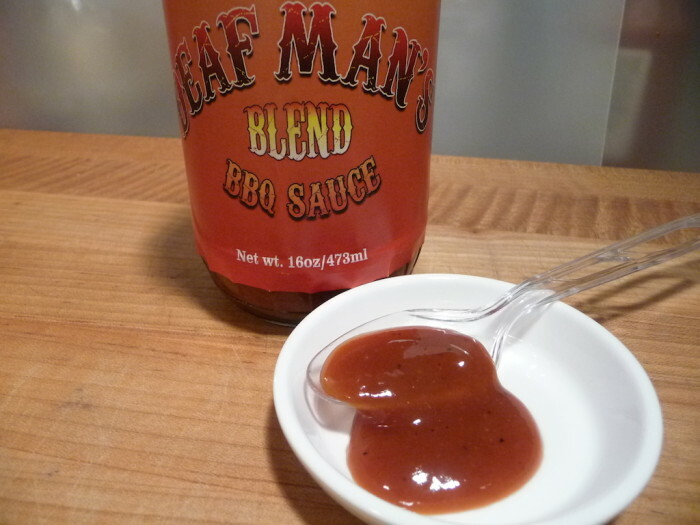 Deaf Man’s BBQ Sauce is the brainchild of Rasool Raheem of Los Angeles, CA. Rasool is indeed deaf, a chef, and a bbq sauce crafter. 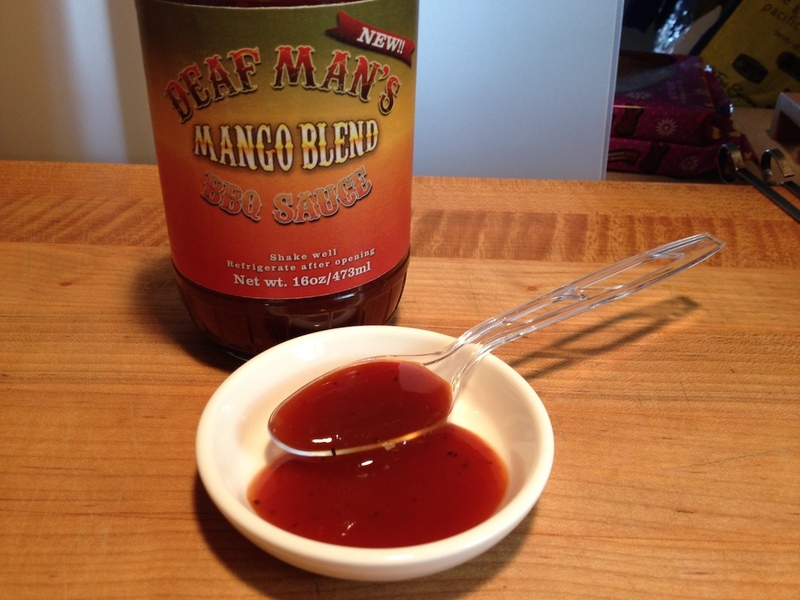 Deaf Man’s BLEND BBQ Sauce, and MANGO BLEND BBQ Sauce are just two of the seven (7) flavors of BBQ sauces he’s crafted so far. Ingredients: tomato concentrate, honey, sugar, molasses, vinegar, HFC, corn syrup, water, contains less than 2% of the following: habanero, salt, anchovies, garlic, onion, hydrolyzed soy protein, tamarind, spices, mustard seed, turmeric, black pepper, natural flavors, natural hickory smoke flavor, guar gum, dextrine, citric acid, potassium sorbate (preservative), caramel color, sulfites (to retain color). Marilyn: This is not a mild BBQ sauce at all. The texture is nice and silky and the first impression is of sweetness from the honey. The vinegar is in the background, which I like, but the habanero gives it too much sting for my taste. My overall rating would be – I love the texture, but the flavor is not too different from other BBQ sauces I’ve had, and the habanero just bites too hard, even after cooking. Brian: This is a thick sauce that clings nicely. It’s indeed peppery and pretty spicy… if this is indeed Deaf Man’s “mild” sauce… it has a kick. I think it would work better as a wing sauce. My overall rating would also be – Two stars for a good start. Pretty spicy for the bottom of the line up. But not a bad start. Ingredients: tomato concentrate, mango nectar (water mango puree, citric acid, natural flavor, ascorbic acid), honey, brown sugar, molasses, vinegar, hfc, corn syrup, soy sauce (water, rice, soy bean, salt), contains 2% of garlic, onion, habanero, salt, spices including: mustard, turmeric), water, anchovies, natural hickory. Marilyn: I think this sauce coats very well on the skewers. The extra sweetness from the Mango adds a welcome flavor and stickiness to the chicken, and it’s perfect on the pineapple slices. Overall rating: – A step up from the “Blend” sauce. My favorite of the two. 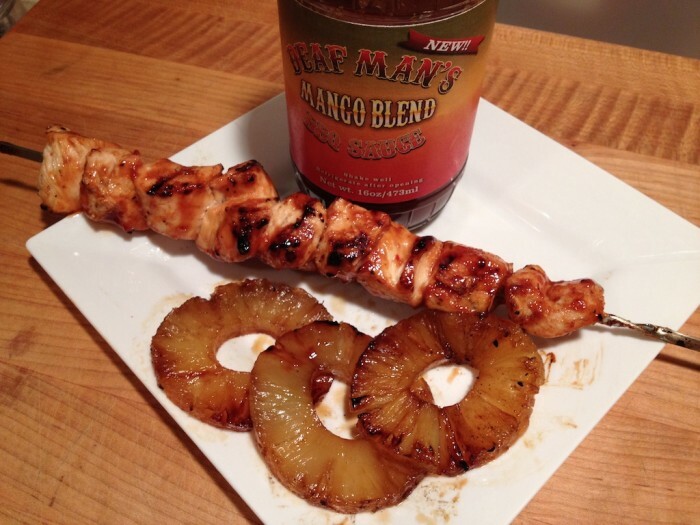 Brian: Great cling factor on the skewers with a nice added sweetness from the mango. A step up from the “Blend” – I agree. My overall rating: – I agree with Marilyn. (Don’t tell her.) Wonderful sauce that does its job well. 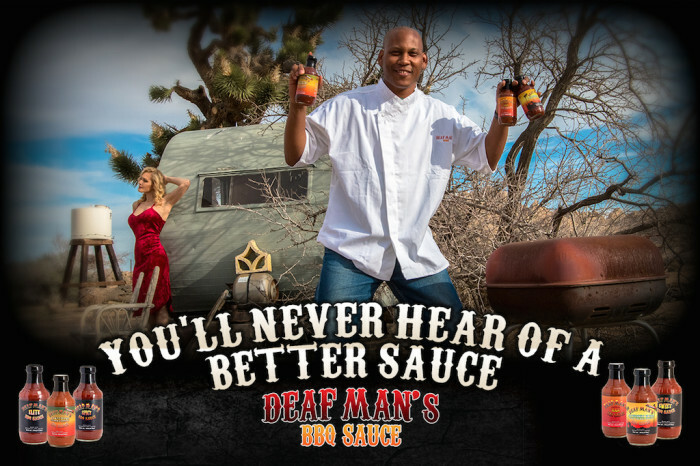 There are actually a few reasons why the sauce was named Deaf Man’s BBQ—the most obvious of which we’ve already covered. Though by that same logic, it could have been called “Snappy Dresser’s BBQ Sauce” or “Excellent Bowler’s BBQ Sauce.” The other thing that convinced Rasool to name it Deaf Man’s BBQ Sauce was because he knew that anyone serving the sauce to family or friends would know what it’s like to be deaf: In those moments between the first bites and the roars of delight, there is absolute silence. The sauce is that good. Visit http://www.dmbbq.com/ to order Deaf Man’s BBQ Sauces. Be sure and check out their sampler offering. This is our first ever review and a good one too.Getting 2 stars on the ‘honey mustard blend’ and 3 stars on the ‘mango blend’ is a good sign that we are on the right track of flavorful BBQ sauce. 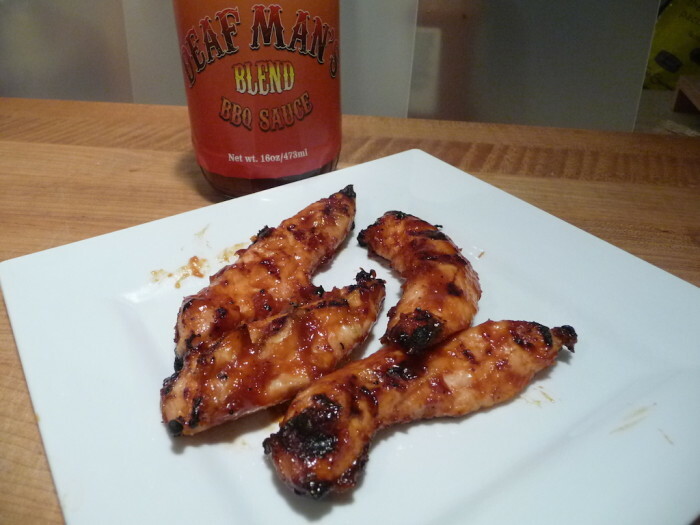 With a line of 10 different BBQ sauce any competition team can stand out by using our sauce. Already had a few big names BBQ pit master try the sauce. At they end, they want the recipe of course I can’t hear them! It was an honoring having our sauce reviewed by ‘Hot Sauce Daily’, proving us at Deaf Man’s Sauce a warm welcome into the sauce world! Thank you Rasool. You do have a great lineup of sauces. We appreciate the opportunity to review quality sauces like yours. Looking forward to the others. I do hope you find a BBQ Comp team to sponsor.